Great resources with lesson plans and free printouts to go with each lessons. Covers many topics related to trees. The students will identify 3-4 ways how trees are used. The students will produce 3 leaf rubbings using one color for each leaf. TLW collect and compare different types of leaves. TLW discuss how leaves how leaves are alike and different. Eight lesson plans to choose from. Learning from the Forest. Lessons by Teachers is a collection of teaching activities and lesson plans developed by school teachers who attended a Wood -- A Remarkable Fiber workshop or the Ecology, Economics and the Environment Forest Tour. Students will "adopt" a tree and throughout the year will record and examine its characteristics and the changes that it goes through. A beginners level science lesson on getting to know the trees. Students will learn simple facts about trees. Includes printable teaching reading comprehension lesson worksheets. Book lists, songs and poems, crafts and other theme ideas for Arbor Day. We are a non-profit organization poised to distribute millions of trees nationally. Check us out! Tree planting and environmental stewardship non-profit membership organization, programs include Tree City USA, Conservation Trees, conferences, youth education, and Arbor Day Farm. Kids enter a contest to design a poster for Arbor Day. Explains how to read a treee cookie. A good explanation of why leaves change colors. Interactive guide to the diiferent parts of trees. Take a virtual walk through the woods. 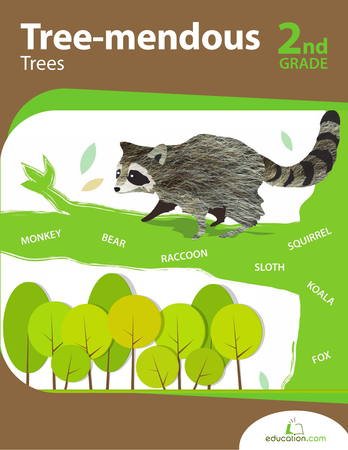 Interactive guide to teach you how to identify types of trees. Tree image with lines to write tongue twisters. A few FREE printouts from a subscription-based site. Contains bookmarkds, a coloring page, shapebook and organizer. Creative writing sheet, wordsearch, crossword, and bingo cards. Wordsearches, mazes, and crossword puzzles with an Arbor Day theme. Make a string of leaves to decorate a room. Make a simple 3-dimensional evergreen tree from construction paper. You can make your own forest of these fantastic trees. This is an easy way to make an image of a leaf, using a real leaf, a piece of paper and a crayon (or crayons). A easy-to-make Pine Cone Bird Feeder. This is a simple project that even young children can help make. Crafts including t-shirts, watering cans, cotton ball tree, bird feeder, bark canoe, leaf prints and more.